With the new year fast approaching, it’s time to sit down and review your content management strategy. One of the best ways to keep your content strategy on track is by creating an editorial calendar. An editorial calendar is basically a timeline that contains all the content you plan to publish over the next year. Editorial calendars are easy to create; manage your workflow; and ensure that you are meeting all of your content goals. 1. Any good content strategy starts with research. Understanding what keywords to hit will help you improve your online presence and SEO. There are plenty of free keyword research tools to help you get started (SEMRush). Once you know your keywords, you can develop some key topics that you should cover. 2. Meet with your core contributors, as well as some representatives from other departments, and have a brainstorming session about what topics to cover. You can also discuss what types of content to make including blogs, photos, and videos. At the brainstorming session, you can also determine who will take ownership of each piece of content. 3. There are two main considerations for strategising your timeline. The first is the frequency in which you plan to publish. Frequency depends entirely on both your resources and your specific market. The second is peak times which include both when people are most active on your website and social media, as well as, important dates for your particular business. Make sure to keep both of these in mind when laying out your timeline. 4. 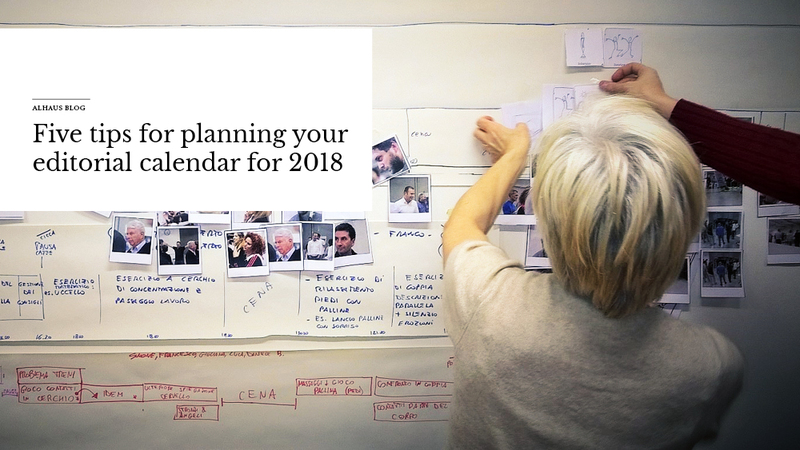 Once you have your ideas and timeline, you need to design your calendar. Make sure that your calendar contains all the relevant information. Include the title, keywords, customer persona, deadlines, publishing dates, writers and editors, and publishing platform. 5. Give yourself some space to adapt to the latest trends and news in your industry. Adding flexibility to your timeline will help ensure you are creating timely and relevant content without overloading or interrupting your workflow. Follow these tips and you’ll be sure to get ahead of the game now. If you are looking for content ideas or are looking to outsource your content creation, speak to a content management expert at ALHAUS. We offer a variety of services that can help you hit every content milestone in 2018.